Dear Lord, heavenly Father, thank you for granting us your word, your spirit and the mission dei, through which we may serve you and mature and grow spiritually. I pray that I can come closer to you and serve you. Help my whole family to know you, love and serve you and find out that you are our “all in all”. Please emboss your word on our heart. I pray in Jesus’ name. Amen.! A great multitude of redeemed people will sing Hallelujah–for salvation and glory and power belong to God. He condemns the great prostitute and avenges the blood of his servants. Heaven will be filled with his praises. All the redeemed will worship God and every knee shall bow and every tongue confess he is Lord. I am inspired by the pure worship of God here. So often we get caught up with what we must do for God. We pray for legalistic things, only asking God to help us be more disciplined spiritually. We pray for maturity and to grow in devotion and holiness. But we ignore the essence of worship. I was like that for almost two decades. I prayed for things that would make my Christian life more efficient and produce more “good works” usually in the form of outward disciples. But did I really dwell in God and revel in his greatness and his glory? Did my heart cry out, “Hallelujah! Salvation and glory and power belong to our God.”? Did I cry out, ““Praise our God, all you his servants, you who fear him, small and great.” The Marriage Supper of the Lamb”? I didn’t live to praise the Lord. I lived to fulfill my mission and to bring meaning and purpose of to my life while in this world…I lived to be a more disciplined Christian, but I did not praise the Lord. Indeed, I was missing a very critical ingredient to my Christian life. It was my wife, who helped to realize what I was missing. In the past I produced a weekly group Bible study and 6 1:1 Bible studies and a fully functional Sunday worship service every week. I was efficient but I was missing the element of praise and worship. Julie want more from our Sunday worship. She wanted to worship God. She wanted a worship experience. For a long time, I just didn’t get it. But eventually I did. We changed our direction and Christ has been getting me back to the heart of worship that praises God. I really need to get back to the heart of worship, newly and on a deep dimension. I need to learn what it is to dwell in Christ and praise his holy name. I need to rejoice, not just because one person is growing as a leader in my church or personal ministry, I need to rejoice in the fact that salvation, glory and power belong to Jesus. I need to praise God from my heart. May God teach me what this means. May God help me to show others the importance of dwelling in Jesus and to simply praise the Lord and create an environment around me that promotes the praises of Jesus. What were they praising the Lord for? Look at verses 1b-2 again. “Hallelujah! Salvation and glory and power belong to our God, 2 for his judgments are true and just; for he has judged the great prostitute who corrupted the earth with her immorality, and has avenged on her the blood of his servants.” They were praising God for the fact that Salvation and glory and power belong to God. And they were praising God for his bringing about his justice. We already talked about the first part. But the second part talks about God’s justice. God, bringing his justice to fruition is very important. God is just God. In Amos, the prophet Amos talks about justice rolling on like river. God is truly concerned about justice. He is not just concerned about our own personal salvation and our relationships. These are very important, but it does not stop there. We need to be concerned about justice. There are whole ministries dedicated to seeing that justice is being fulfilled. Lord, open our eyes to your greater purposes in this world. Part 2, Blessed Are Those Invited To The Wedding (6-10). There is another reason for worshipping and praising the Lord. Look at verses 6b-7, “Hallelujah! For the Lord our God the Almighty reigns. 7 Let us rejoice and exult and give him the glory, for the marriage of the Lamb has come, and his Bride has made herself ready;” In this passage, the time for the wedding supper of the Lamb has come. The bride–the Church–has made herself ready. She is clothed in white linen–the righteous acts of saints. 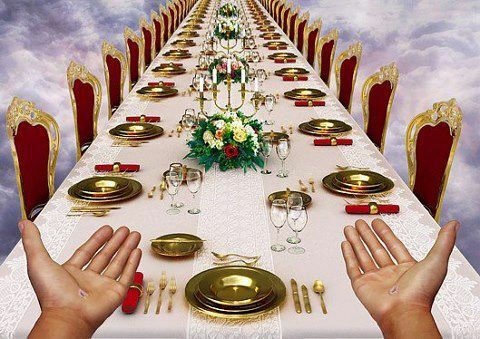 Blessed are those who are invited to the wedding supper of the Lamb! These are the true words of God that we should hold onto. What a great reason top rejoice and praise the Lord. We are the bride. Jesus is the groom. There is a wedding. Who does not like going to a wedding? I was just at my nieces’ wedding. It was a joyful experience. I am so glad that I could be part of it. I really looked forward to it. Actually I attended 3 weddings in 2013. Each one was filled with so much joy. I was invited by the grace of the wedding couple. In one wedding I was the best man. It was the pure grace of God. The wedding of the Lamb is also the pure grace of God. On my own, with my sin, I could never be part of the wedding of the Lamb. I could only dwell outside of it. But by God’s grace I am in the most beautiful and joyful banquet ever! It is all because of the grace given me through the sacrifice of my Lord Jesus on the cross. The same invite is given to all who put their faith and trust in Jesus Christ. This world tries to deceive us that we are pitiful or foolish to give up the fleeting desires of the flesh. But in the end, the truth will be revealed, and the righteous will be the most blessed. Look at 7-9b, “7 Let us rejoice and exult and give him the glory, for the marriage of the Lamb has come, and his Bride has made herself ready; 8 it was granted her to clothe herself with fine linen, bright and pure”—for the fine linen is the righteous deeds of the saints. 9 And the angel said to me, “Write this: Blessed are those who are invited to the marriage supper of the Lamb.” The glory we, who hold to Jesus’ testimony, share in heaven is overwhelming. We may choose to not enjoy everything this world has to offer. Way may be rejected by family members and befriended from Facebook. We may be excluded from certain parties. We may be considered out of our minds for what we believe. But, we are not martyred or fired and cast out, like some Christians in some lands. But it is all worth it. We are at our eternal wedding with Jesus! Living a Christian life, with its devotions, praying, preaching, witnessing, repenting and forgiving and spending, with all our other various acts of righteousness, are not in vain. Look at verse 8, “it was granted her to clothe herself with fine linen, bright and pure”—for the fine linen is the righteous deeds of the saints.” They are all used by God. They become part of the wedding of the Lamb. They bring glory to God. They bring beauty to the wedding of the Lamb. They become and integral part of God’s salvation. John marveled so that he fell down in worship of the angel. The angel corrected him and told him to worship God and testify to Jesus! It shows you that we must never worship angels. But we must worship God alone. Prayer: Lord, thank you that any believer is blessed to join in the wedding supper of the Lamb and share in your glory. Fill my heart with your praises and show the world how wonderful you are. One Word: Blessed are those who are invited to the wedding of the Lamb.